Features micro-grain carbide cutters diamond honed to 600 grit mirror finish! 3 flute, carbide tipped with 8mm (approx. 5/16") bore and totally enclosed ball bearing guides. 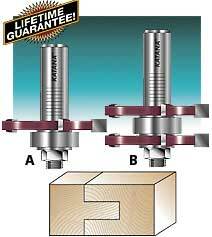 Cut slots (kerfs) for biscuits, tongue and groove joints, T‑moldings, lap joints, and rabbets. The cutter, arbor, and bearing are available separately or as a complete assembly with a 7/8" bearing. Precision ground up to tolerances of +/- .005" on CNC multi-axis grinders. Katana bits are machined to tight tolerances, to prevent runout and the resulting vibration. The end result is a high quality cut. Katana bit bodies are cut on a CNC lathe from a solid bar of SAE 4140 steel, heat treated up to a Rockwell hardness of 45 RC! 3 flute, carbide tipped with totally enclosed ball bearing guides. 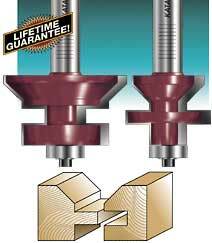 The double 1/4" cutter makes the tongue, and the single 1/4" slot cutter cuts the groove. 1/4" and 1/2" shank. For wood thickness from 1/2" to 3/4". Just completed a set of Mission style cabinet doors...My first time with the Katana bit set. If I could I would give the set 10 stars. Precision cuts without any blowouts. The species of wood was red oak and the bits did a wonderful job. I highly recommend this product! I bought this set for making cabinet doors. This is a very solid set and cuts like crazy. This set has done a great job for me and I would recommend it to others. Bought these to build my cabinets. Made a perfect tight fit. Clean cut with no problems. Katana® router bits feature high hook and shear angles for smooth, efficient cutting. 2 flute, carbide tipped with fully enclosed ball bearing guide. This set is a 2 bit system for producing interlocking 1/4" high tongue and groove with a V-groove on the face. Excellent for paneling or flooring. A fence is required. 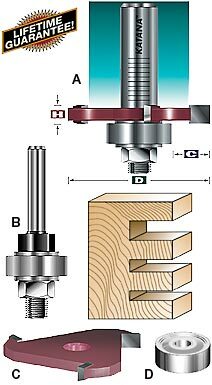 For wood thickness from 5/8" to 1‑1/8". I bought the v tongue and grove katana a few years ago to route 5/8 x 6 inch cedar boards 8 foot long for a pourch floor. I did enough for a 24 foot wide floor. That set of bits did a great job of making a nice straight cut. I used a hand held 3 hp router and it was nice and sharp when done with that project and been used for other projects. Katana is a great product. Very High Quality. Perfect tight joint.